Sword swallowing is unsettling and awe inducing, but is far more than a snack of saber souffle. Sword swallowing dates back to India 4,000 years ago, and only a hundred or so people in the world practice it today. 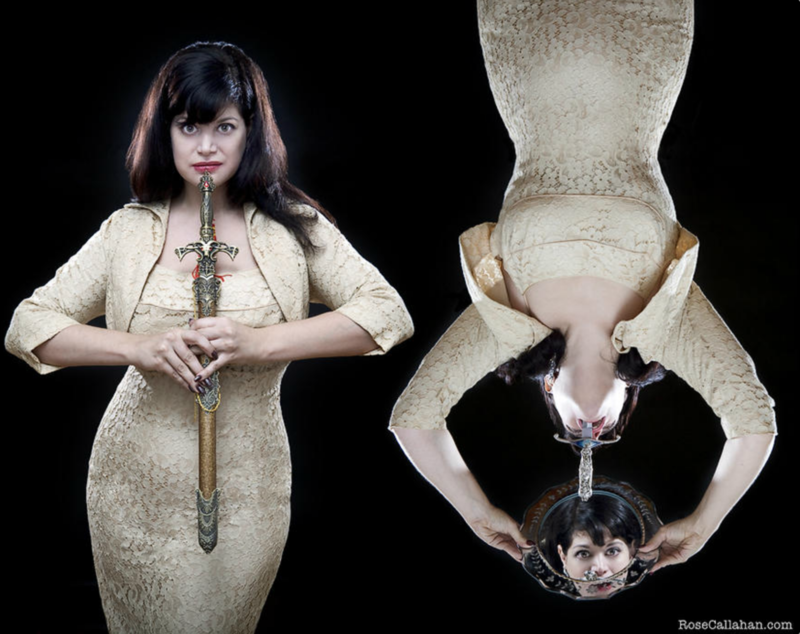 What all sword swallowers have in common is a mastery of their gastrointestinal anatomy that allows them to slide a 16-inch sword — or longer — all the way into their gut. “People liken the process to doing a split. Some human bodies are set up for it, some human bodies are not,” said Ilise S. Carter, 42, a professional sword swallower and sideshow performer using the stage name The Lady Aye. She performs frequently, and recently discussed the history and anatomy of the skill to a crowd of about 100 in a dark basement at Brooklyn’s Morbid Anatomy Museum, which features wax medical specimens, taxidermies, and a library with books on the macabre. Learning to swallow a sword is a mental game of controlling involuntary bodily functions. “What was extraordinary to me was how much time and effort the sword swallowers put in to being able to do it,” said Brian Witcombe, a British radiology consultant whose sword swallowing study published with Dan Meyer in the British Medical Journal won him an Ig Nobel prize in 2007. Carter fits this mold exactly. She recounted her apprenticeship as “brutal,” spending two years practicing, developing a routine, and incubating a mental relationship with her involuntary reflexes, where the secret lies. Today, Carter splits her time performing and as a freelance journalist, but she wasn’t always a sword swallower. As a teenager in Manhattan, she was inspired by the punk rock attitude of freak show performers, but ultimately began working as a financial editor because “that was a job that paid money.” Carter didn’t begin swallowing swords until around eight years ago, beginning her training after receiving a pep talk from artist and fellow sideshow performer A.V. Phibes. The training process starts with the performer suppressing the gag reflex and opening the upper esophageal sphincter, a muscle that acts as a seal to open and close the esophagus. They then shift their bodies in order to straighten their esophagus, allowing the sword to pass the bend around their heart. Finally, they must open their lower esophageal sphincter to allow the implement to enter their stomach. To the layperson, controlling the upper sphincter is at least logical, since this is where the gag reflex lives. However, controlling the lower esophageal sphincter is what really impressed Abraham Khan, a gastroenterologist at New York University’s Langone Medical Center. Khan explained that the lower sphincter has about a third of the pressure of the upper sphincter keeping it shut. However, it only opens when the body swallows, and its functions are completely involuntary; Khan did not know how one could control the muscle. Carter didn’t quite know how she controlled it either, aside from intense concentration. The lower esophageal sphincter is closely linked to acid reflux, an ailment Carter said afflicts some older sword swallowers. If the muscle is weakened, acid can seep out of the stomach and irritate the sides of the lower esophagus. Long term, this can cause Barrett’s esophagus, a condition in which the normal esophageal cells have been replaced with tissue similar to that of the intestine. The disease can lead to an increased chance of contracting esophageal cancer. How does someone decide for the first time, “Hmm, I think I’ll try sword swallowing”?